My coworkers and I went to a vegetarian restaurant near work, for lunch. One of my coworkers thought it was an Asian restaurant because of the name “Yam Leaf Bistro”. Turns out, the place used to be a meat-heavy Salvadoran restaurant before it was sold to a Chinese vegetarian who kept the Salvadoran chef and wait staff. The owner also changed the menu, to make it vegetarian only. The two of us ordered horchata. 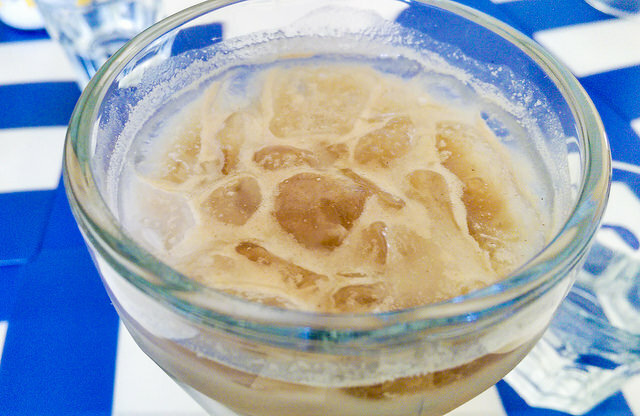 Salvadoran horchata. Yam Leaf Bistro’s horchata has grounded morro seeds mixed with milk or almond milk. We went with (regular) milk. 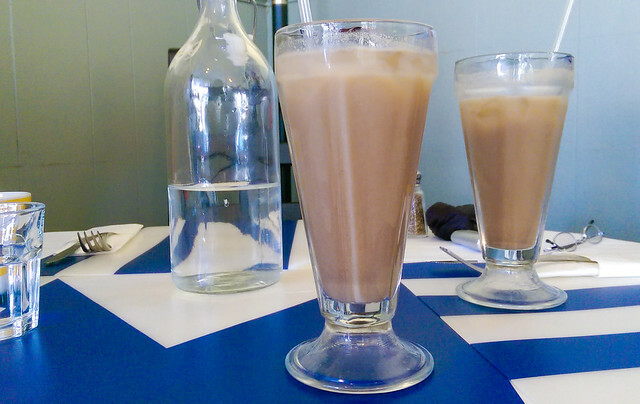 Notice how Salvadoran horchata is browner than Mexican horchata? That’s because they use morro seeds instead of rice. The texture was the same, but with a different taste. Salvadorans are fiercely loyal to their horchata, made from the seeds of morro, a green, hard-shelled fruit that looks like a coconut. Mexicans are just as steadfast about their rice-based drink, which Salvadorans won’t touch. Spaniards, who consider their nation the parent of the real horchata, dismiss the claims by people from their former colonies. They insist that their creation, prepared from roots they call “earth almonds,” is the only drink worthy of the name. The morro grows on a wide-branched tree, part of the calabash family. The small, gourdlike fruit stands out because it is attached directly to the tree’s trunk and branches. For farming families, morro trees were a prominent part of the landscape. The black, lentil-shaped seeds are the tree’s coveted treasure. Pried from the fruit’s pulp, “they are put in the sun to dry and then they’re ready to be ground,” Velasquez says. The resulting powder is blended with water to make horchata. The seeds have a hypnotic smell, Velasquez says, something like that of the Ligurian olives he worked with at Dupont Circle’s Pizzeria Paradiso. He also doesn’t like the growing tendency toward using milk instead of water. “In my country, you never, never use milk,” he insists. The Salvadorans’ bond with horchata is strengthened by their attachment to the morro tree. Its canopy offers shade on hot days. Its fruit nourishes their animals. And the hollow morro shells were valuable household containers. The tree inspires devotion in a religious people: Its distinctive leaves, says Melvin Nunez, a baker at the Cosi coffee shop north of Dupont Circle, are shaped like crosses and transfixed early Spanish explorers of the Americas.